Last night Mr. Aitch and I had a lovely candlelight dinner complete with wine. We got about 12 inches of snow yesterday. I left work early and managed to make the 18 mile trek in Mr. Aitch’s 4-wheel drive truck in about an hour. The trip usually takes about 20-25 minutes. Cars and trucks were scattered all over the roads. The I-68 was shut down. I was just getting ready to turn off the stove and put dinner on the table when we saw a flash of light coming from outside and the lights flickered. As we looked out the window, we saw a bluish-green light in the valley. Then an explosion. The transformer blew and the power went out. It wasn’t total darkness as there was still enough daylight left to get out the flashlights and find some unscented candles for the table. I turned off the burners on the stove. 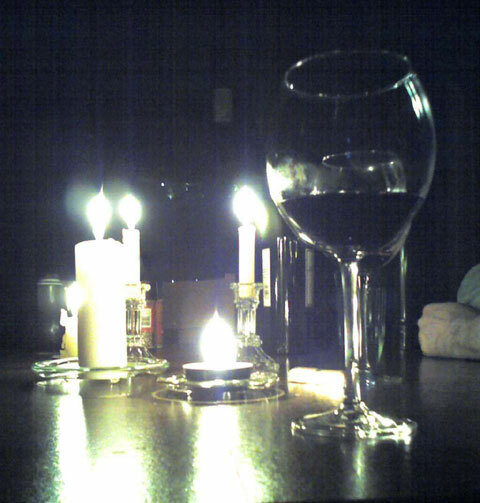 Mr. Aitch poured the wine and we sat down to enjoy a candlelight dinner. I needed to cast on (again) for my special knitting project but there was not enough light for me to see what I was doing. I can knit in the dark but I really do need to see the stitches when I cast on and knit in the round at least for the first couple of rounds. So we worked on a crossword puzzle. The power was restored about two hours later but we still don’t have phone, cable or internet service. This entry was posted in knitting, Random and tagged knitting, random thoughts by Patti_is_knittinginflashes. Bookmark the permalink. I love it when the lights go out because it gives me a good reason to go to sleep early. I’ve been listening to CNN and all the hubbub about the snow. I know it’s hard on the cars and the kids, but isn’t it beautiful? Haven’t seen a snowflake since we moved to Florida. We are expecting 2 to 3 inches of snow over night which means I will have to push the snow around if I want to meet my exercise ladies tromorrow. I love the snow – don”t like pushing it around to get my car out and in. Oh, poor me..
What a great excuse to go to bed early. Of course my husband would turn on his battery radio (I think we have at least 1 in every room as he LOVES to listen to the radio)and the nice peaceful quiet would be talk radio.Very nice to have a romantic evening w?hubby!